That was my immediate reaction when my brother called me and asked how I felt about an early morning fall hike into Sydenham Falls. 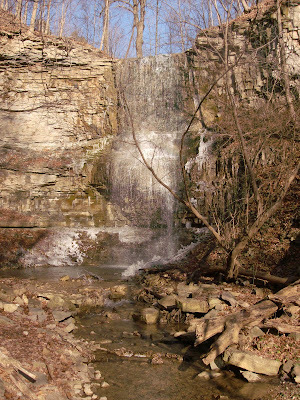 Having lived in this area for over 20 years, I thought I knew the trails and waterfalls in the area pretty good. Even more incredible, this waterfall was only 5 minutes away. 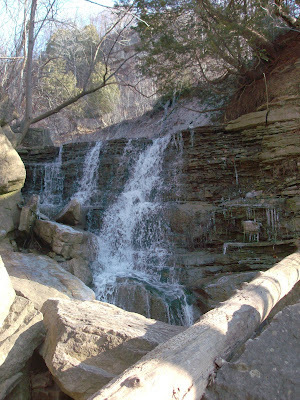 A quick check on the website http://www.cityofwaterfalls.ca/ revealed that this specific area featured not only one, but three waterfalls! So with sons in tow and accompanied by a very excited Rosie the wonder dog, we headed out to explore. I had seen the trail heading into the woods at the bottom of the Sydenham Hill in Dundas, Ontario for years, not ever realizing the beauty and amazing rock formations that would appear just steps beyond the entrance of this trail. 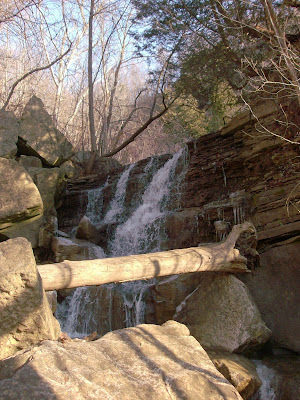 The first waterfall that you come to is called Lower Sydenham Falls and it is approximately 13 feet high and is located below the railway bridge that crosses Sydenham Creek. As you continue up the trail about 100 metres, heading steadily uphill into the escarpment, you will find a side trail on your right with a very steep downhill grade. This somewhat treacherous descent will take you to the bottom of Middle Sydenham Falls. The climb is worth it as this washboard curtain falls which is about 20 feet high is spectacular! Heading back up the main trail, you arrive at Upper Sydenham Falls, which at approximately 45 feet tall is the largest of the three. It is a beautiful ribbon type falls and is a great spot to take photos. Buying a new RV? A checklist will help make your purchase that much easier!! Check it out!! An avid hiker and camper, Cam has visited many parks and trails throughout Ontario. Cam is the author of Exploring the Dundas Valley and was the recipient of the 2015 Hamilton Independent Media Award in the category of environmental journalism. Have you ever arrived at a provincial or private park, set up at your site and then kicked yourself that your choice of site was not the best? Having spent years travelling through Ontario's park system, I hope to save you some time and aggravation by making recommendations as to the best sites, the ones to avoid and letting you know the highlites of each park, and the surrounding area.